I am writing this article on the day that new MPs, following the May 2010 election, will take their oaths to the Queen. In the UK only avowed monarchists can sit in the Houses of Parliament. Before taking their seats in the commons those we elect as MPs have to take an oath of allegiance to the hereditary monarch. I think this is a terrible state of affairs and it is time for a gentle, quiet, democratic revolution. If the Lib Dem MPs, and the Green, all of whom have stood on manifestos to remove the monarch’s role in Government, stuck to their principles and simply promised to serve their constituents and the country, rather than taking an oath to the Queen then there is no doubt in my mind that the revolution would happen. I think this would strengthen and reinvigorate democracy, it would help create a true democracy in the UK. During the election campaign I spoke to Julian Huppert; and asked him if he was intending to take the oath. He replied to say that while he was very much a republican he thought he had to pick his battles and thought that this wasn’t one worth fighting. He confirmed he would swear allegiance to the Queen. I think that if even one English, Welsh or Scottish MP refused to take the oath and took their seats regardless, never mind all the Lib Dems refusing, that would in itsself force the change. I suggested to Mr Huppert that he underestimates the amount of influence that he as Cambridge’s MP has. I think not grasping the power they are given by the electorate is a problem endemic within the Liberal Democrats. When I spoke to Mr Huppert he explained to me that his worry was that if he and other Lib Dem MPs didn’t take the oath then the Parliamentary authorities would make life difficult for him and his colleagues, for example preventing him from being able to table questions and preventing them from speaking. Again this worries me because it appears that he hasn’t grasped that we, through him and the other MPs, run this country not the “authorities”. I think that it would be a terrible start to a Parliamentary career to put strongly held principled views to one side for convenience. The people of Cambridge surely wouldn’t accept it if the person chosen by the city to represent Cambridge in Parliament was unable to do so as a result of standing by the position on which they were elected. Until the oath or affirmation is taken, an MP may not receive a salary, take their seat, speak in debates or vote. They could also be fined £500 and – more important – have their seat declared vacant “as if they were dead” if they attempt to do so. @JulianHuppert You can add words before/after the oath. How about: “As a republican under duress I solemnly swear…”? I would like to see Julian Huppert take a stronger stance against the oath than the one he gave me when I asked him about it, then he said: “I will not say it with joy and rapture”. It is not only with Julian Huppert and his Commons oath that we see the Lib Dems actions failing to match up to their stated beliefs. The Liberal Democrat run Cambridge City Council still starts its meetings with a Mace (representing the monarch) being brought into the room, councillors stand for its entry and it sits on a stand infront of the Mayor throughout the meeting. This entry was tagged Democracy, Huppert, Julian Huppert, Liberal Democrats on May 18, 2010 by Richard Taylor. As an “avowed monarchist”, I’m glad at Huppert’s change of heart. Not least because that if we tinker with isolated parts of what Constitution we have left, the law of unintended consequences will come into play in spades – eg the impending emasculation of the House of Lords as a revising chamber when it is elected. I agree that keeping the House of Lords working in its current role is critical. I think it should continue contain “experts”. I think there needs to be change though; Many groups eg. doctors could elect their representatives. I think there ought some degree of Proportional Representation in the Lords too; and Lords Ministers need to be accountable, at the bar of the commons, to MPs. In terms of constitutional change I am opposed to the switch to fixed term parliaments propped up by the requirement for 55% of MPs to agree to a dissolution. That’s tinkering with the constitution in an attempt to keep the current government in. I expect we may well see the Lords have a role in discouraging MPs from pushing that through. Of all the changes being mooted at the moment, I don’t see AV – which is the only one currently expected to go to a referendum – as the most dramatic and important. I’d rather see referendums on the Lords and on fixed term Parliaments. 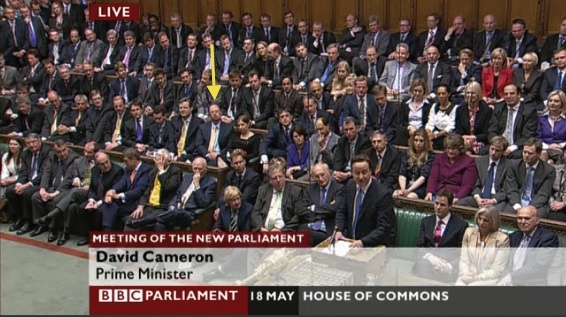 Cambridge’s new MP Julian Huppert has taken a seat right in the middle of the action, sitting next to Sarah Teather. I hope this indicates an intent to actively and passionately represent Cambridge in the Commons. Loving the colour of the arrow! About time we had fixed term parliaments. The Chartists thought a year was the correct term of course. Perhaps it should be like the City Council, with 20 per cent of the MPs standing down every year. The 55% is a fiddle of course. Clearly the two parts of the coalition don’t trust each other. I can see why an MP would take the oath but I don’t think a public act of hypocrisy is a good start to a parliamentary career. I would be unwilling to affirm allegiance to the queen, though I agree a majority of the people in the country support her and that the country is likely to remain a monarchy in my lifetime. It’s not even a major issue for me – but my very mild republicanism prevents me from the kind of political involvement I might otherwise have pursued and also from a range of public roles. If only one MP stood out against the oath/affirmation of allegiance, I might feel I had political equality. I sometimes wonder how far I’m bound, in ethical terms, by laws passed in a parliament which would deny me admission, even if I were elected. I’m not (yet) a dangerous revolutionary but a reasonably respectable, middle-aged Quaker who came to the conclusion that, on balance, a republic of citizens is probably better than a monarchy of sovereign and subjects. Kathz – I too wonder how many people are put off playing a part in deciding how our society is run by the requirement to take the oath in Parliament. Mr Huppert was first asked by the clerk if he wanted to “affirm” or “swear”; he opted to affirm. The affirmation option doesn’t invoke God whereas swearing involves asking for God’s help and holding/touching the bible or another holy book while making the declaration. Mr Huppert asked if he needed to give his : “full title and things”. This raises the question of what Mr Huppert considers to be his “full title”, he has not used any name other than “Julian Huppert” during his campaign for election. Perhaps by “and things” he was referring to his academic qualifications. The clerk responded to say no, and told him to merely state his “name and constituency so that it is recorded”. The clerk went on to say to Mr Huppert that his point about “electronic production” had been well made and Huppert received an assurance from the clerk that “we are doing our best”. This presumably refers the call for greater use of technology and for less paperwork to be printed which Huppert tweeted to say he had made during an informal meeting of new members in the House of Commons. Mr Huppert then signed something – which I expect was a commitment to abide by the code of conduct for members. Before leaving the chamber Huppert shook hands with, and briefly chatted to the Speaker, though the microphones in the house did not pick up this exchange. You do write the most arrant nonsense sometimes, Mr Taylor. I suggest you read up on the civic maces. This seems like a pretty small issue to me and I’m not going to hold it against Julian Huppert for not starting his political career in Westminster with admirable antics like Dennis Skinner’s. The Sinn Fein MPs do as you suggest and refuse to take the oath to the queen – this means they can’t represent their constituents in the House of Commons. I’d prefer my republican MP to swallow his pride and then try and change the system from the inside – not give up his seat on a point of principle (however admirable). Perhaps Cllr Rosenstiel would care to elaborate on his earlier post so that mere mortals can understand the true significance of civic maces without having to read up on the subject. Or perhaps this information is available on Cambridge City Council’s website? Perhaps while the councillors and their guests are digging into their taxpayer funded sumptuous feast during the upcoming annual meeting I’ll see if I can get into the chamber and read some of the material about the regalia which is present in the display cases which usually house the mace. I have read much of what is there previously, it is largely about the city’s many royal charters. I agree that there is a large amount of nonsense in this thread – “taxpayer funded sumptuous feasr” is drivel almost worthy of the Daily Mail – in any event I think Richard has helped himself to those sandwiches in the past – and I am not sure what saving vould be expected from members bringing their own packed lunches – is this an example of the waste that will be cut to clear the deficit? And incidentally did Julian H swear or affirm, I’m not clear? I always thought well of Edward Boyle’s view that no promose is improved by a man holding a book, his word should be enough. The feast at annual meetings really is a feast – it’s not just sandwiches. I was quite shocked when I saw it last year. I think this kind of thing is interesting to note as it shows the attitude of our councillors to spending public money – but I agree there are better examples – and I draw attention to those too. The video embedded above shows Mr Huppert affirming; I’ve also noted this in the comment too now. Republic: The system of government designed to go with the word ‘banana’. I agree about the oath, but it’s the charters (legally binding contracts between the monarchy and its powerful supporters–professions, commercial interests, cities, institutions). As you appear to be a member of Cambridge University, you might attempt to get a copy of its most recent charter. Apologies for not finishing my first sentence. Royal charters give the chartered body the right to do anything and everything without worrying about consequences. Fraud, among other things, is pre-excused in exchange for loyalty to the Crown and some financial contributions to HM’s schools and military. The monarch (and this has been true since 1067 when William the Conquerer granted one to the City) orders her ministers to give favourable treatment to chartered bodies and order her judges to protect them. Richard Normington ought to be more careful of his botantical references now that his party is supported in power by a coalition with a group of rubber plants. In the circumstances, being ruled by a banana may not be entirely inappropriate. Speaking at PMQs on the 23rd of June 2010 David Cameron indicated that he would like to see the Sinn Fein MPs in the House of Commons so they would be there to debate against. He said at the moment “we let them off the hook”. He was responding to a question about the fact they get their pay and allowances despite not attending. Presumably to enable them to enter the house the oath to the queen would need to be removed.